An Adjustable Camera is typically found in virtual environments that do not have a first-person or embodiment view. It allows the user to reposition their view of the environment from either one of a range of options, or free form throughout the world. For fairly obvious reasons, adjustable cameras are not particularly compatible with total immersion systems, as they serve as a constant reminder that the user is not embodied in a form within the virtual environment. Logitech's G19 keyboard is in its own way, a serious attempt at a mainstream VR interface. It is designed as a gamers keyboard, attempting to heighten immersion for gaming for the majority of users who do not touch-type. The board actually has an adjustable liquid crystal monitor built into the back of it, above the function keys. 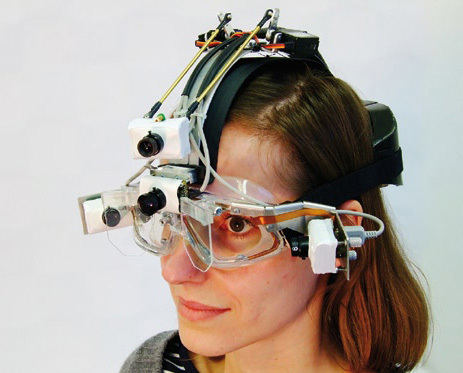 It may look a little ungainly, and perhaps not best for use in outside environments, but the EyeSeeCam, developed by biomedical engineers and clinical neurologists at the University of Munich Hospital, is camera designed to store and transmit the exclusive point of view of its wearer's eyes. 3D Cameras will make Virtual Worlds Easier to Use? A counterpoint to the recent hype about availability of 3D positional camera interfaces for mainstream virtual worlds by 2009-2010. A good idea? Yes, but lets not get carried away. A new type of speed camera that does not flash and requires no film is being tested in west London. Industrial robots are mostly power-hungry workhorses, but this new mechanical arm and hand uses no more energy than a couple of electric toothbrushes. Liquid Image, a company which made a splash last year with diving masks featuring a built-in still and video camera, now has its lens trained on the ski slopes.